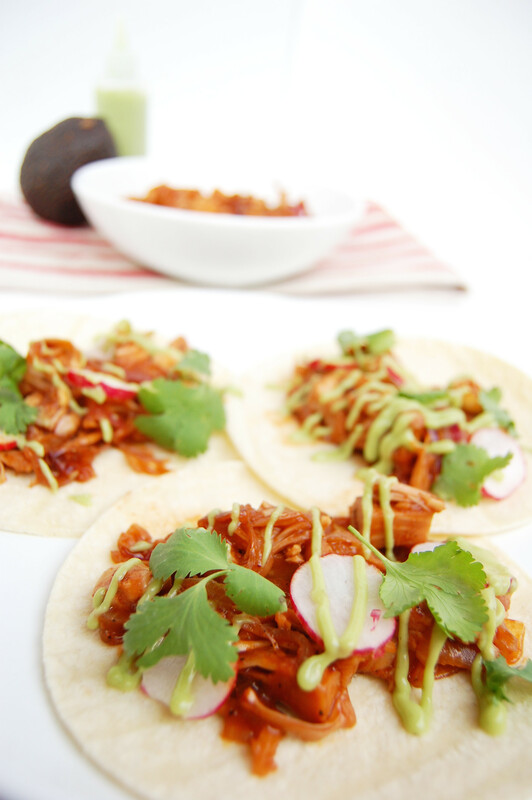 BBQ Jackfruit Tacos - Are You Kitchen Me?! Hi, my name is Natalie, and I’m addicted to tacos. If I could eat everything wrapped up in a tiny tortilla, I would. It’s perfect hand-food, patio-food, and can even be health food! 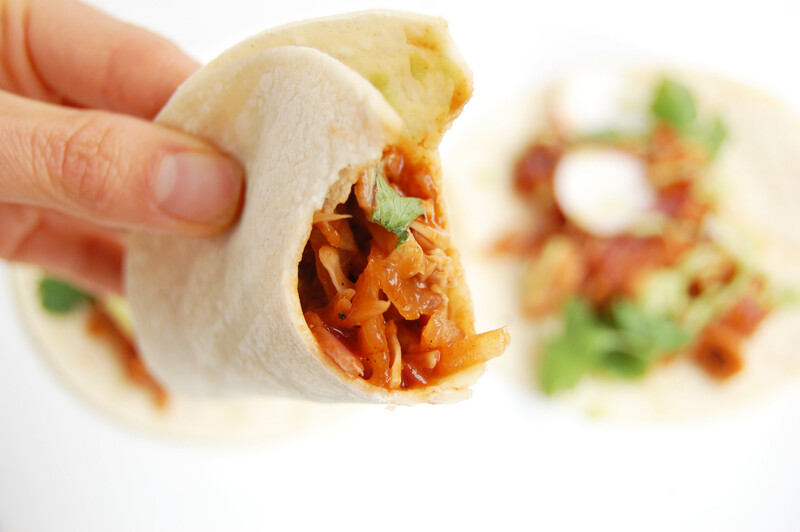 Case in point, BBQ Jackfruit Tacos. 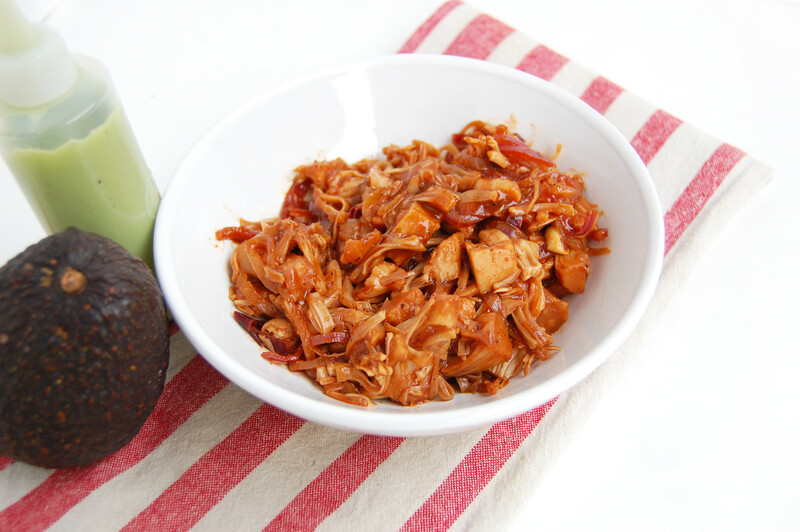 Anywho… Jackfruit. Say whaaat? Jackfruit is a strange fruit. Literally. The average jackfruit weighs 50 pounds, has a rather pungent body-odor-like smell, and is covered in rough, scaly spikes. Sound more like a baby dinosaur than a taco filling? Hang in there with me. Once some brave soul attacks this monster fruit and gets to the seeds, the soft flesh protecting each husk is revealed. And THERE is where the gold is. What makes it a great meat substitute [and thus, taco filling] is its slightly stringy, shredded consistency and relatively mild flavor. Toss it with any sauce you like, and you’re on your way to vegan barbeque cookout heaven! If you’re not in the mood to hack up a fruit the size of a toddler, the best way to get ahold of jackfruit is to buy it canned. 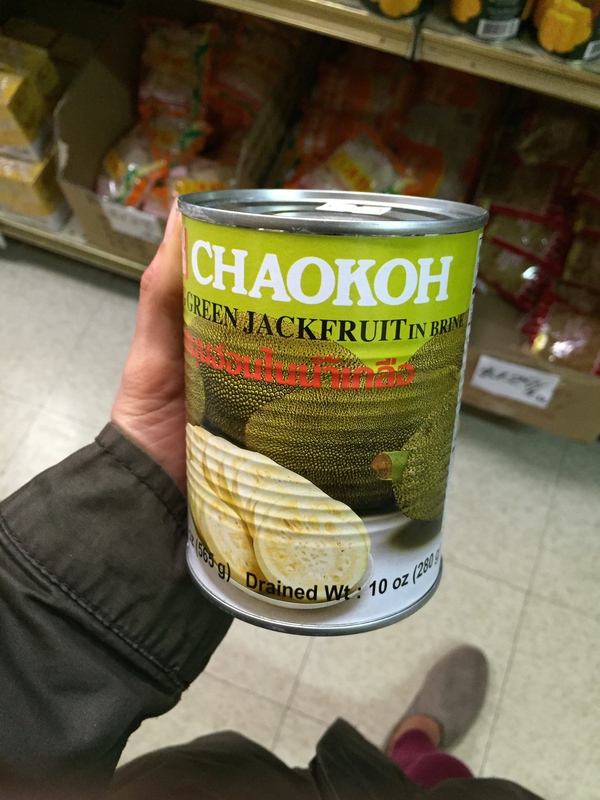 I will say, it took me a while to find jackfruit in Columbus, but now I know that most Asian grocery stores in the area carry it. The important [and I mean very important] thing to remember is that you are looking for jackfruit in BRINE, not syrup. Here’s a snapshot I took of one straight off the supermarket shelf. If you can get through all the scary stories of monstrous fruit and scaly skin, you’ll find that this recipe is actually a cinch to prepare! The canned fruit is ready to be tossed with flavoring and sautéed until soft and warm. 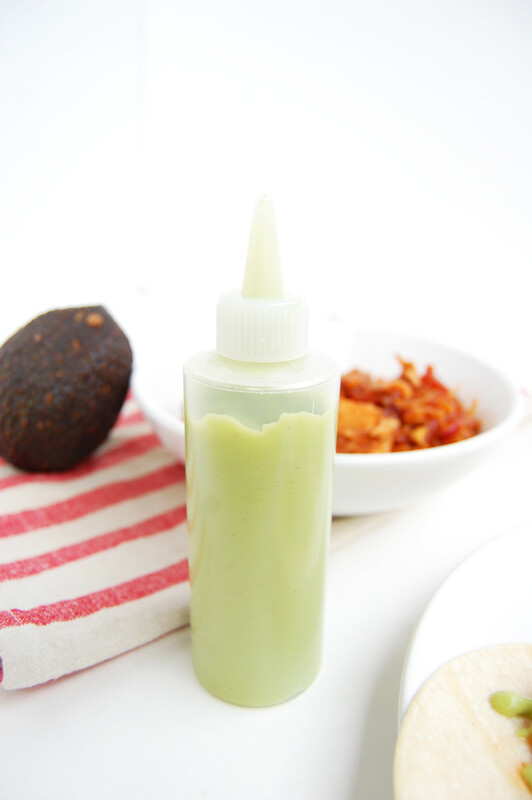 I whipped up the avocado cream sauce while the fruit simmered and everything was ready in 30 minutes! 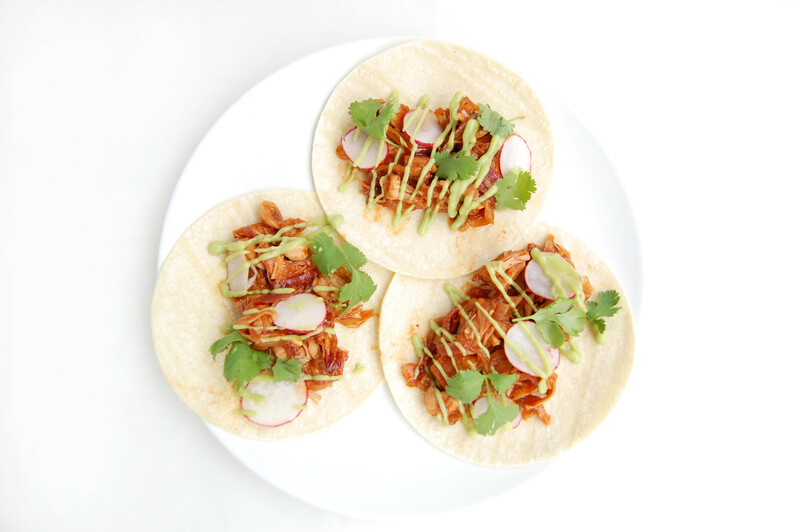 If you want to get really crazy, swap in a brew for the water, just like in my BBQ Beer Tofu- because what are tacos without a cold one right?! 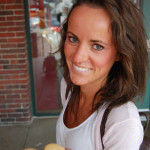 Next Taco Tuesday, try using a crazy fruit to make crazy delicious and crazy simple dinner! 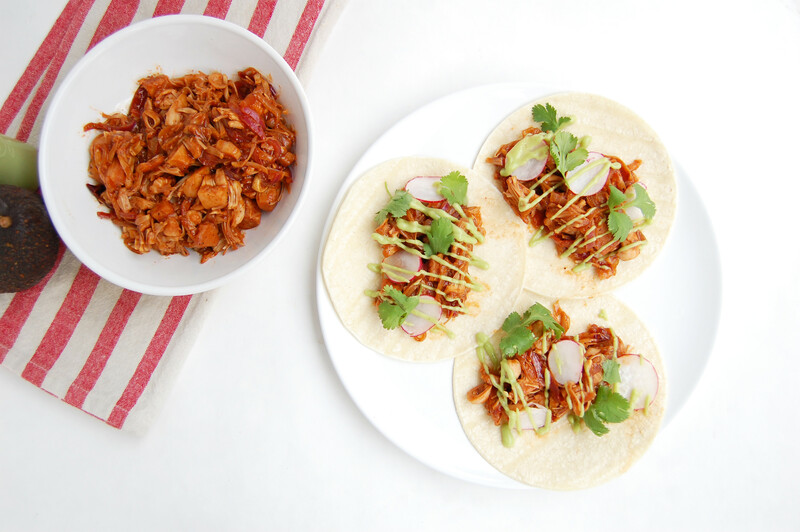 BBQ Jackfruit Tacos are a weeknight win! Heat a large sauté pan over medium heat and add onions. Cook for 8 minutes, adding water to be sure it doesn’t stick. Add the jackfruit, spices, and salt to the pan and use a wooden spoon to break up the large pieces. Cook, stirring frequently for 5 minutes. Add barbeque sauce and water or beer and bring to a simmer. Cook, stirring frequently until the jackfruit is coated in a thick sauce. While the filling is cooking, add all cream sauce ingredients to a mini food processor or blender and blend until smooth. Assemble the tacos by laying filling, garnishes (radish, cilantro, sprouts, etc. ), and cream sauce into taco shells. Enjoy immediately!